A caramel apple is a sweet treat I’ve always admired from afar. It’s the sort of thing that “looks” appealing to eat… all of that gooey caramel wrapped around a crunchy, juicy apple- sometimes even rolled in toasted nuts or, better yet, M&M’s. But it’s also the very treat that I’m unwilling to tackle eating. The idea of trying to navigate through a thick layer of caramel and manage a bite that leaves your face a mess of sticky goo and dribbles down your chin is entirely unappealing to me. Instead, I caramelize apple slices, which is a much neater, safer way to eat fall’s favorite fruit. Here’s my latest very simple dessert creation, utilizing Puff Pastry: Caramelized Apple Waffle Pastries with Cinnamon Whipped Cream. Peeling the apples is the most time consuming part of this recipe. I like to use Granny Smith’s. Peel them, core them, and cut them into wedges. They’re sauteed in butter, sugar and spices, with a touch of cornstarch to thicken the syrup and a splash of vanilla for flavor. 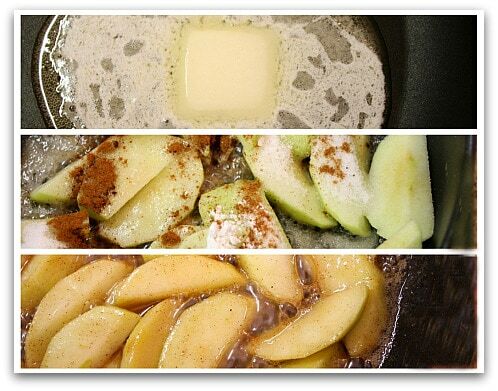 They simmer in that buttery, sugary mixture for about 15 minutes, until the apples are tender, caramelized and swimming in thick, cinnamony juices. Set the mixture aside to cool down. Frozen Puff Pastry (thawed) is used for this dessert. Simply cut down the two seams to make three large rectangles, then cut each rectangle into three equal pieces. You’ll end up with nine rectangles. Heat a waffle iron and spray with nonstick spray. 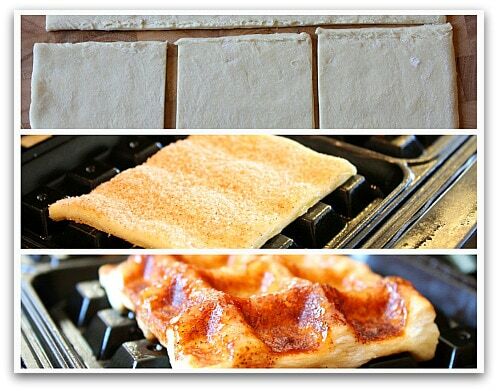 Sprinkle each piece of Puff Pastry with cinnamon-sugar and set into your waffle iron. Close and cook for 2 to 3 minutes, or until the pastry is puffed and golden. Repeat with the rest of the Puff Pastry and set the waffles aside. Whip heavy whipping cream until thick and stiff peaks form. Stir in a half teaspoon of vanilla and a sprinkle of cinnamon. 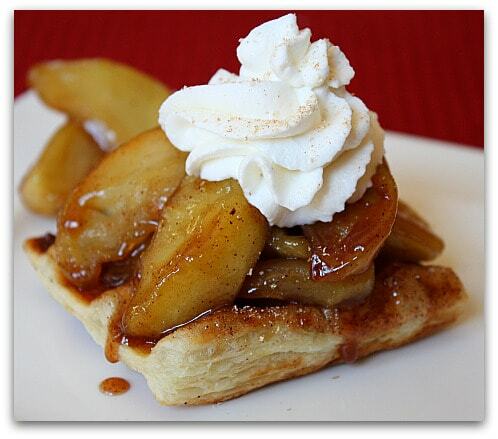 Place waffle pastries on platter and top with caramelized apples. Drizzle pan juices on top. 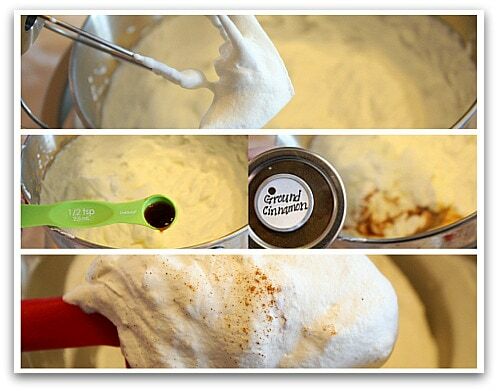 Pipe whipped cream on top of apples and serve. The best part about this recipe is that it can be prepared ahead. Everything can be served cold. If you’d rather serve it warm, top the steamy apples with a scoop of vanilla ice cream and a drizzle of hot, caramel syrup. This post was sponsored by Pepperidge Farm Puff Pastry. Do you have a Puff Pastry creation to share? Enter the 1, 2, 3 Puff! Recipe Contest and you could receive an all-expense paid trip to New York City for a taste of the sweet life! Find more great recipes and enter to win at 123puffpastry.com. Prize Winning Pie Contest Recipes! This is the most GORGEOUS and BRILLIANT idea I have ever seen with puff pastry! I wish I could make one of those and just freeze it in time to use as a permanent centerpiece at my dinner table! I MUST try these soon. Thank you so very much for making my mouth water and my tummy growl! P.S. It looks so easy, too! This recipe looks so impressive! And simple enough to do before I have guests over! Puff Pastry Waffels just made it to my dessert menu! This was amazing. I made it last night – it was so quick and easy. Everyone loved it! Thanks for sharing. Love it! Thanks so much for sharing this really cool idea using Puff Pastry. I want to try to enter the contest. Oh wow..I would have never in a million years thought to put puff pasry on the waffle iron! GENIOUS! I love that you used the waffle iron. I would have never thought of that. What an easy and delicious looking dessert! I gave it a thumbs up! What a creative idea! These look delicious…can’t wait to try it! Looks superb! Your recipes are always fabulous and the pics are awesome. Thanks for sharing this! Super delicious idea! My tummy is grumbling just looking at your photos! This is a beautiful recipe. I had no idea about using puff pastry for the waffle! So quick, easy and elegant! We do love a good caramel apple but I must slice mine up first since they are so messy to eat. CARAMEL APPLE TOPPING?!??!??! Stop it – that is just too amazing. Holy yum!